Over time we’ve had requests from Landscapers, Handyman and Concreter’s to supply skip bins Brisbane with wheelbarrow doors for access. This enables the person pushing the wheelbarrow to push the load straight into the skip bin. With this in mind we sat down and considered how we would go about satisfying our client base. Our customers are our main focus. So if you take into account the weight of wet soil per cubic metre (roughly 1.8 tonne) you can then work out the largest skip we can transport safely. Safety is a high level concern of Lightning Skips so we take this very seriously. Firstly, the skip truck can carry a maximum load of 7.5 tonne and with the average skip bin weighing around 500 kg this left 7 tonnes for spoil, rock, concrete etc. With wet soil being the most common and heaviest medium we can then work out which skip bin we would offer with the wheelbarrow door feature. Therefore 7.5 ÷ 1.8 = 4.16 cubic metre so we can safely carry a 4 metre skip bins without consideration. We then went about getting two of our 4m Skips Modified. 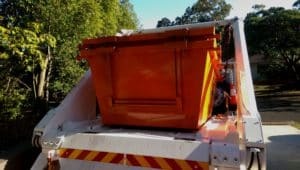 Don’t forget we deliver budget skip to Brisbane Southside and Brisbane Northside and we don’t charge a premium for the 4m skip with the wheelbarrow door feature. Since this blog we have added 5 cubic metre skips to our skip bin stock and can carry up to 7 tonne of waste now. All of our trucks can carry 7 tonne of waste to make sure all of our customers are receiving a consistent service.